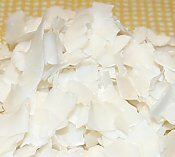 Creamy coconut ice cream is a timeless classic and one of the top 10 downloads from this site. 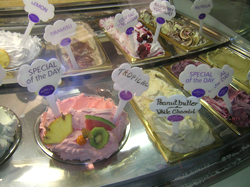 Discover the delights of French ice cream - it's another world entirely! An Italian word literally meaning frozen, gelato is more commonly used by English speaking people to refer to Italian ice cream Originally called mantecato, gelato is believed to have its origins in Northern Italy. What is the difference between gelato and traditional American style ice cream? There are 4 principal differences - fat content, key ingredients, texture and taste. Gelato contains less butterfat - 4-8% compared to 10-18% in American style ice cream. Gelato's key ingredients are whole milk, sugar (usually caster sugar), flavorings (especially fresh fruit) and sometimes skimmed milk powder (adds viscosity and helps stop ice crystals building up). Most standard gelato recipes do not use cream or eggs but when cream is used, it's often a good idea to ensure there are strong flavorings in the recipe to avoid the gelato becoming too bland. Gelato is not as frozen in texture when served - it's more of a semi-frozen ice cream and is generally best eaten fresh on the day it's made. The taste of gelato is generally agreed to be purer on the palate, especially gelato made with water (sorbetto). If you love gelato come join the ice cream discussion! The method of making gelato is not really any different to that of the standard recognised method for all quality ice cream - ie. freezing the mixture whilst being stirred, a method you can pretty much emulate at home using an electric ice cream maker. It's this method that ensures ice crystals don't build up. Gelato also has quite a low % content of air in the ice cream. Too much sugar in a gelato recipe will mean it won't freeze properly (sugar lowers the freezing temperature) and too much alcohol in a gelato recipe will stop ice crystals from forming. So getting the balance right of ingredients such as these can take a bit of experimentation. Non-dairy gelato originates from Southern Italy and is made with water and fruits - generally referred to as sorbetto. 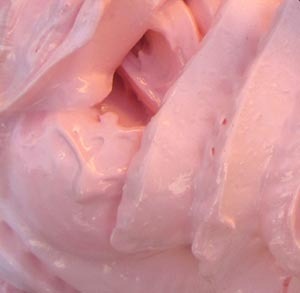 The texture of sorbetto can vary depending upon the ingredients, especially the level of sugar content. Not enough sugar in the sorbetto will produce a grainy texture but some people in fact prefer this because it allows the other ingredients to have a stronger taste. When making homemade gelato, it is generally best to put it into a freezerproof container with lid and freeze for about 2 hours before you actually serve it for eating. When you remove your homemade gelato from the freezer it can sometimes be a little too hard. If this is the case, remove the lid and put the container into a refrigerator for 20 to 30 minutes before serving. This should give your gelato a good texture that is enjoyable to eat. 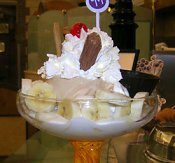 Gelato is usually served in a bowl with wafers/biscuits or in a cone. If you buy gelato at cafe or ice cream parlor you'll find it served from a different kind of freezer to what you normally see for American style ice cream. It's called a forced air freezer which prevents the gelato from becoming too frozen. 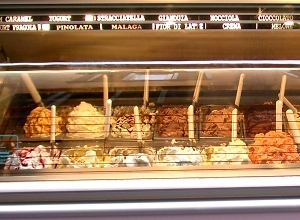 See photograph left - forced air freezer in a commercial gelataria. 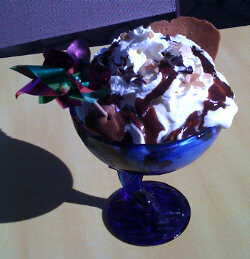 If you are interested in gelato and other Italian desserts there is more on Wikipedia.